image of latest photograph and signature in Jpeg format only for uploading and a copy of X Class Certificate. Decide the mode of payment of fee. The candidates are not required to send hard copy of confirmation page to TSTET unit. However, the candidates are advised to retain the hard copy of the application i.e. confirmation page. TS TET 2016 Online application are invited from the eligible candidates who intend to be teachers for classes I to VIII in schools in Telangana State for appearance in the First Telangana Teacher Eligibility Test (TS-TET , 2016) to be conducted by Department of School Education, Government of Telangana State on 1st May , 2016 in all 10 Districts of the State. The fee prescribed for appearing for TS-TET (including examination fee) is Rs. 200/- (Rupees Two hundred only) for only Paper-I or only Paper-II or both. Candidates can pay the fee through TS online or Payment Gateway centers between 15.03.2016 to 30.03.2016 and submit TS TET 2016 Online applications at the TS TET 2016 Online application website http://tstet.cgg.gov.in between 16.03.2016 to 31.03.2016. Candidates can apply for TS TET 2016 Online application to be held on Sunday 01.05.2016 ‘ONLINE’ only through TS-TET website http://tstet.cgg.gov.in from 16-03- 2016. 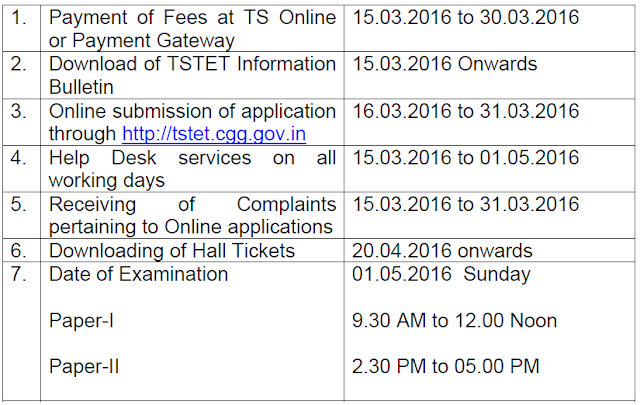 Steps to be followed for submission of TS TET 2016 Online Application Form. i. The candidates shall first download the ‘Information Bulletin’ free of cost from the TSTET website http://tstet.cgg.gov.in, go through it carefully and satisfy the eligibility for appearing for TS-TET, 2016.
ii. The candidate after satisfying herself/himself about the eligibility criteria for TSTET shall pay a fee of Rs.200.00 per paper I or paper II or both through TSONLINE or payment gateway between 15-03-2016 and 30.03.2016 for submission of application Online. At the TSonline or Payment gateway, the candidate has to give the required preliminary data (i.e. Name of the candidate, Date of Birth, Gender, whether the candidate belongs to Telangana State, mobile phone number etc.,). On receipt of fee at TSonline or Payment gateway the candidate shall be issued a ‘Journal Number’ with which she/he can proceed with submission of application online. Issue of Journal Number does not mean that the candidate has completed submission of application online. It is only a confirmation of the fee received. a) Paste the photograph on a white paper and sign below (sign in Black Ink only). Look for the sample at point 18(iii), of the Information Bulletin. Ensure that the signature is within the box. Scan the required size containing the photograph and signature. Please do not scan the complete page. The entire image consisting of photo along with signature, is required to be scanned and stored in *.jpeg format on local machine. Ensure that the size of the scanned image is not more than 50kb. If the size of the image is more than 50 kb, then adjust the settings of the scanner such as dpi resolutions, number of colors during the process of scanning. b) Applications with no photo / unclear photo / inadequate size photograph will be rejected. Hall Ticket will not be issued to such candidates. Hence, after pressing the ‘UPLOAD’ button, check if the photo is of required size, clear and is of the same candidate of whom the details are to be filled in the application. If the photo is smaller in size, not clear or does not belong to the candidate, press ‘BACK’ button below the photograph on the application form and restart with scanning of the photograph. c) Complaints relating to mismatch of photograph, candidate details will not be accepted after submission of application at any cost. 3. For latest updates, please check at TS TET 2016 Online application website http://tstet.cgg.gov.in.